Yup, my kids have cell phones. I got them cell phones to alleviate my anxiety. As they get older and are off doing all kinds of activities without me, the cell phone allows me to still “be there”. However the cell phone world is not as magical as I imagined it to be. I imagined my daughter texting me while babysitting and my son giving me a play-by-play when he joined a new youth group that he was nervous about. This is not my reality. My reality is kids disappearing in their room to text their friends, phones turned off or on silent when I really need to call, messages left for friends late at night, texting at Grandma’s when they should be socializing and extra charges for extra usage. Cell phones, tablets, iPads, X-Box, have all created new parenting territory. My husband and I are not always sure how to navigate this new territory. We have rules but every once-in-a-while we need to reign in the kids and reinstate or change some of the guidelines. Posted in Kids and tagged cell phones, contract. Bookmark the permalink. I thought about that in the midst of all the heart wrenching stories coming from Connecticut. Teachers that hid students, teachers that read to students to calm them, teachers that told their students that they loved them. Some teachers will react to the news in fear and extreme cautiousness. But as I look at our six year olds singing the Hallelujah chorus for our Christmas program, I just feel so grateful. Grateful to play a part in their lives. Grateful to be entrusted with these special gifts. Posted in Uncategorized and tagged love, protection. Bookmark the permalink. We know we should take the time but we just don’t. Our explanations and lessons would be so much better if we did. We need to try activities before we ask our students to do them. Many times an activity could have gone more smoothly if I had just tried it first. 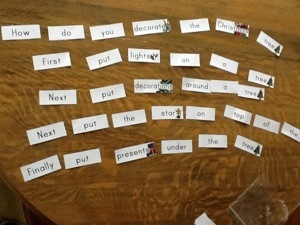 I found this Christmas activity that I will ask kids to do in partners. 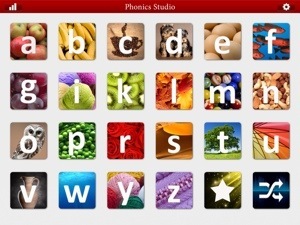 It targets sight words and transition words. I tried it first myself to figure out strategies I would suggest for students that seem overwhelmed by the task. I think I will give students the title and some blank cards so that they can add words. 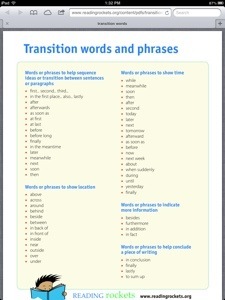 I realized that I first picked out the transition words so I decided I will first teach a mini lesson on transition words and ask students to identify the transition words in their packet of words. Trying the activity myself will definitely affect how I approach this lesson. 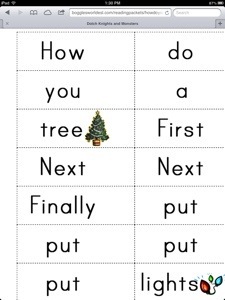 Posted in Reading, writing and tagged examples, sight words, transition words. Bookmark the permalink. Another app. I like this one for articulation practice. You can choose a target sound and record the speech for instant feedback. You can choose whether the target sound will be in the beginning, middle, or end of the word. Best of all, it’s free! 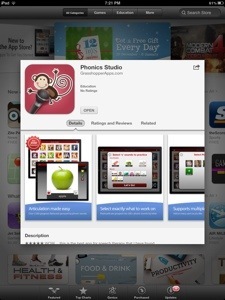 Posted in apps, Speech and tagged app, phonics, speech. Bookmark the permalink. It’s a talking calculator and it has improved student accuracy on a calculator! So many of my students were not accurate with a calculator – pressing the wrong buttons. With this app they hear their mistake. When they do make a mistake they can backspace rather than starting all over. 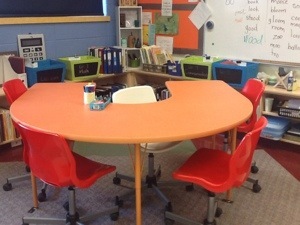 Love the multi-sensory approach. I love using this app. It has improved my speed, accuracy, and confidence in my calculations. The app is free but adding the voice costs a bit. Also, be sure to have headphones if others are around. 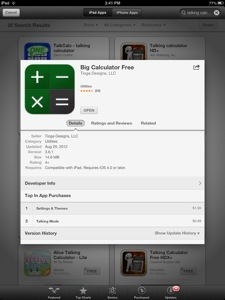 Posted in apps, Math and tagged app, calculator, Math. Bookmark the permalink. I am lovin’ my new horseshoe table! Custom made in tangerine! Posted in Classroom and tagged table. Bookmark the permalink.